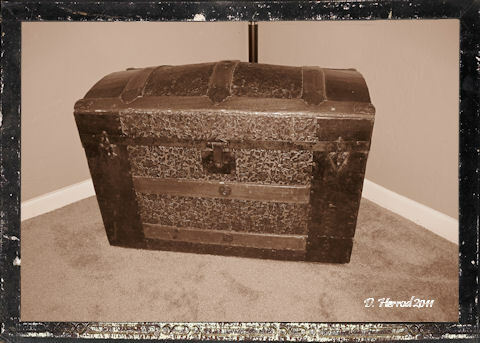 Trunk that belonged to my great-great grandparents. This trunk belonged to my great-great-parents. They brought it across the Mississippi River in a covered wagon when they moved out West in the late 1800’s. We shipped it back east in a moving truck when we moved to the east coast in a the early 2000’s. Check out more weekly photo challenge. I’ve always wanted one of these things. Me too. Forunately, I inherited mine. I had a trunk just like this one! After moving it with us five times, I finally gave it away (no one wanted to buy it) rather than move it cross-country with us again this time. Of course, mine wasn’t a family heirloom or I would have been less likely to have given it away. I’ve had offers to buy it but I’m keeping it.